George’s certification was issued by Dance Vision, an internationally recognized dance syllabus. 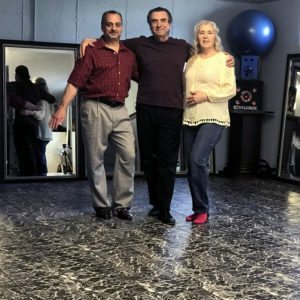 He was examined and achieved that certification in Bronze level, with honors, by the late Bill Morganti, a former professional Ballroom instructor specializing in International Style Standard, Latin and American Style. Bill was certified with ISTD, NADTA and UKA. He was an Adjudicator with National Dance Council of America, World Dance, and Dance Sport Council before passing early 2018. George competed briefly as an amateur in 2011, but now specializes in social dancing. He has 2 years experience as an independent dance studio instructor and 6 years experience as a nite- life adult, continuing education instructor before opening his own 500 sq. ft. studio in 2015. He offers private lessons, single or couple at $35 per hour as well as group lessons. Pricing varies depending on how many people attend. My wife Eve & I met George a few years back at Indian Meadows (now known as Acacia) in Westborough Massachusetts, where they had Big Band ballroom dancing. George would give lessons for all an hour prior to the main event. Eve and I attended the dances with 2 other couples, getting there early to learn, follow, and take part in Georges Dance instructional lesson (which we all really needed). I approached George to compliment him on his dancing, and his instructional lesson, asking him if he offered lessons, and if he would work with the 3 couples. (God Bless Him, we needed the work). We all attended lessons at Georges studio on & off for the last 2-3 years. We developed a relationship with George not only as an instructor, but also as a friend. Eve & I are now preparing for the eldest of our 4 children’s wedding, attending weekly classes with George. George has a special place in his heart for dancing. As an instructor it shows not only in his technique but in his heart. George would like to see you to look your best taking the time to review each step as many times as it takes (with me that could be quite a few). That being said George is very patient while you are there, reviewing each step with me over, and over until I got the step I was missing. My daughter and her fiance will be starting their lessons with George, along with my daughter & I for the Father daughter dance. George has choreographed a custom waltz to a particular song I chose for this dance. Eve & I recommended George to several people for lessons, all that have gone to George for lessons have had a good experience along with good reviews about their experience. We highly recommend George as a dance instructor, for all dancing, Ballroom, Swing, Latin, and Hustle. His dance rates are very reasonable. We give George’s Dance Studio a 5 of 5 thumbs up.